Barbados is arguably the most beautiful Island in the Caribbean. The strong colonial links, magnificent beaches and fine cuisine make it the most desired destination for the discerning British holidaymaker. Lantana Resort Barbados 3 stars This property has agreed to be part of our Preferred Property programme which groups together properties that stand out thanks to their excellent service and quality/price ratio with competitive prices. Participation in the programme requires meeting a specific set of criteria and takes into account feedback from previous guests. Each furnished apartment at this tropical property comes with a fully equipped kitchen, a washer and dryer and a comfortable seating area. They also feature a flat-screen TV. Guests who want to cook at home will find a supermarket within a 5-minute drive, and the area offers a variety of dining options, many located within 1 km. Barbados Wildlife Reserve is only 3 km away, while Royal Westmoreland Golf Course is a 5-minute drive from Lantana Resort Barbados. Folkstone Marine Park and Museum is a 5-minute drive away, and Grantley Adams International Airport is 30 km from the property. 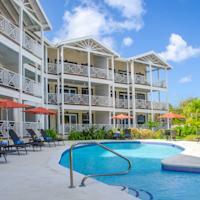 Offering an outdoor pool and a restaurant, Treasure Beach Hotel & Spa is located in Saint James. It is situated right on the beach and boasts modern suites with free daily breakfast. Each suite here is air-conditioned and includes a flat-screen TV, a seating area and a spacious bathroom with a shower, bath and toilet. Some have an ensuite spa bath. At Treasure Beach Hotel & Spa you will find a fitness centre, while other facilities offered at the property include a ticket service, a tour desk and luggage storage. An array of activities can be enjoyed on site or in the surroundings, including water skiing and snorkelling. The property offers free parking. Folkestone Marine Park and Museum is 3.5 km from the property, while Grantley Adams International Airport can be reached in a 45-minute drive. Mullins Bay Town House has a private patio, 3 bathrooms, a seating area with a flat-screen TV and a fully equipped kitchen with a microwave and fridge. Free Wi-Fi and air conditioning are included. 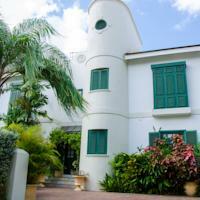 Free parking is available at the Mullins Bay Town House. 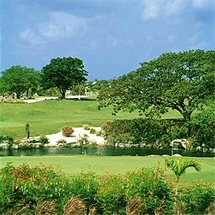 The famous Royal Westmoreland and Sandy Lane Golf Courses are within a 10-minute drive. Bridgetown is 16 km away, while Grantley Adams International Airport is 32 km away. Featuring free WiFi throughout, a spa centre and a year-round outdoor pool, All-Inclusive Divi Southwinds Beach Resort is located in a private area of Dover Beach. Some units include a seating area to relax in after a busy day. Certain units have views of the sea or pool, and all come with a private bathroom with free toiletries and a hairdryer. The resort has a children's playground and guests can enjoy a drink at the bar. Free private parking is available on site. There is a 24-hour front desk, babysitting service, a business centre and hairdresser's at the property. This resort has water sports facilities, and bike hire and car hire is available at this resort and the area is popular for snorkeling. Bridgetown is 11 km from All-Inclusive Divi Southwinds Beach Resort, while Long Bay is 18 km away. The nearest airport is Grantley Adams Airport, 10 km from the property. The most important places to visit are: Harrison's Cave (even on the hottest day in Barbados it's cool down below in this popular show cave, which is also a nice rainy-day option), Hunte's Garden (horticulturist Anthony Hunte has transformed a sink-hole in the middle of a rainforest into a lush and beautiful series of gardens that are open for tours that may include an encounter with Hunte himself), George Washington's House (George Washington really did sleep here -- he visited in his youth along with his brother, Lawrence, during his first foray outside what would later become (thanks to his leadership) the United States) and many more. Beaches - Explore the best beaches! Review of the best beaches in Barbados Here is a video that I made over several day showing some of the best beaches in Barbados. If you look at the map of Barbados beaches, you will find that I covered most of them. The video starts off on the boardwalk near Accra beach and continues to the last shot of foul bay. 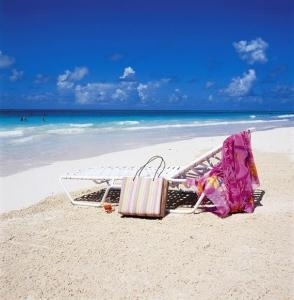 One of the best beaches is one of the Barbados beaches near Bridgetown called Brown's beach. It is very popular with the cruise ship crowd as it is not far from the cruise terminal in Carlisle bay. After going around Bridgetown the first beach I found was Brighton beach then off to Payne's bay on the west coast. Sandy Lane beach is hard to get to because the resort uses a guard station. Holetown beach was next followed by Mullins Bay beach which is associated with the Royal Westmoreland resort is very slim and crowded with hardly any place to park. Here is a link to the Mullins web cam. Up the coast towards Lucy you will find the Speightstown beach and of course the beaches of Port St. Charles. One of their beaches is very private while the other can be accessed via the public access between the now closed Almond Beach Village (formally Heywoods) and the resort. I had my honeymoon 28 years ago at Heywoods. The south coast is by far my favorite place for beaches. The waves are bigger and well more fun. The boardwalk takes you from the beach in front of Coconut Court and the luxury Palm Beach condos all the way to Accra Beach. Accra Beach ( here is another of my videos http://youtu.be/4tVS8jwEfl8 ), is my favorite where you will find me for 2 weeks every year under the tree near the food and beverage huts. Also know as Rockley Beach, this spot keeps the lifeguards very busy as the undertow can be impressive. The next beach going south is the famous Sandy Beach where you will find Carib Beach Bar beside Crystal Waters. You can go out pretty far there before the water reaches your waist. Every Sunday there is a beach party with live music and plenty of people drinking a lot of beer and spirits. It is wild. The next beach I filmed was Dover Beach. Located in St Lawrence gap, this beach is very popular with a great spot at the Southern Palms hotel. At this hotel is there with a great restaurant, Colors where you can listen to steel pan music on Sunday's. Nice view of the beach from this open air restaurant. Beside that is the all inclusive Barbados Beach Club. At the end of the gap is Turtle Beach which you can access via Maxwell coast road. The Bougainvillea resort is on the same beach and sandwiched in between is the luxury condo Ocean's One. Public access is between Oceans and Turtle beach resort. Off to Oistin's I went to visit the fish market there. There a beach there but I never see people in the water. Further along Miami Beach just south of Oistins is a very popular beach with the Little Arches Hotel and restaurant close by. I have personally seen the transformation of this formerly know as Enterprise beach from a little used almost private place to a bustling place with hardly a parking space to be found. 15 years ago we used to be able to park under the trees. There has for the longest time a food truck there Mr Delicious that serves everything from fish cakes to rum punch and fish cutters. The truck is still there however there is no more parking under the trees. Great beach! Bathsheba was my next stop. Located on the rocky and breezy east coast this is a very popular stop for tour buses. The views are spectacular as you wind your way down from narrow mountain roads. The eroded rocks being pounded by the waves stand like statues in the surf. From there we headed to Bath Beach and Martins bay. You will see in the video some great footage. Crane beach is a little bit of a challenge to get to. You either have to pay to get into the Crane resort ( which is redeemable for lunch) or risk it parking down a very very narrow lane and walking over 50 feet of rock to get to the beach. Thank goodness that someone has built and created concrete walking pads over the coral rocks. The last beach we went to was Foul Bay which is located next to Crane Beach. No swimmers there as you can see at the end of the video. There are opportunities to explore the stunning island by land, (going off - road in a 4x4 Land Rover or hiring a car), by air in a helicopter tour, or by sea on board one of many cruises on offer. Barbados is arguably the most beautiful Island in the Caribbean. The strong colonial links, magnificent beaches and fine cuisine make it the most desired destination for the discerning British holidaymaker. Many attractions are easily accessible and the friendly residents are always happy to offer help and advise. Money - Barbados or US Dollars are accepted everywhere on a straight 2BDS for 1USD exchange rate.. Its worth checking with your own bank if they have any affiliated branches in Barbados who dont charge for foreign withdrawals, i.e. Barclays customers can withdraw from Scotia Bank with no commission cost. Swim with wild turtles in Carlise Bay. You really will see them swimming around in this calm bay very close to Bridgetown. Diving and snorkelling are very popular here. Water sports in Barbados of all types are generally available. Nearby Silver Sands is famous for its wind and kite surfing, Jet ski, sailboats and hobbycats are available to hire at most of the popular beaches. Enjoy the awesome Harrisons caves. Ride on an electric tram through the subterranean Barbados stream passages of this natural limestone wonder. A must do trip to the islands most famous site. Beautiful Orchid World has thousands of orchids of every imaginable colour nestled in a tropical garden, with waterfall, stream and fountains. A favourite spot for Barbados weddings. Magnificent Sunbury plantation house is a superb example of a Barbadian sugar estate great house, where every room is open to the public. Full of antiques and collectables, steeped in history and very interesting. Visit the Barbados Flower Caves and the north tip of Barbados, walk through the underground tunnels and view the sea anemones that gave name to the caves and take a dip in one of the natural pools. Outside there are some spectacular rugged cliffs and sea views. Ocean Park is a family orientated facility, with water fun and pirate themes. See sharks, rays and barracuda swimming in massive tanks, walk under simulated ocean scenes, or learn about the projects to preserve and protect the marine environment around Barbados. The Barbados Malibu rum distillery, gift shop and beach provide an opportunity to taste a cocktail and learn the history of this world famous drink. Take away a souvenir key ring or t-Shirt, always a conversation starter. There are many rum shops in which to try the local beverages. You could also try a guided tour of the distilleries, the Mount Gay Tour being a favourite, or maybe a trip to the Banks Brewery to taste the Barbados Island's beer. To get a different view of Barbados, helicopter flights leave from Bridgetown, or several companies lead guided 4-wheel-drive tours through sugar cane fields taking you to places of stunning beauty, whilst giving an informative overview of Bajan culture and history. Barbados Boat cruises are reasonably priced and leave from Bridgetown harbour. Most provide lunch or day trips with food and drink provided. You will be taken to exclusive bays and have the chance to snorkel with turtles. Finally the Barbados wildlife reserve is a great day out for the family. With the opportunity to mingle with Bajan monkeys, otters, deer, tortoises, caimans and exotic birds. Have fun and understand why Barbados is the British holidaymakers' most desired destination. We fell in love with the island on our first visit and decided it was the island for us to return to year after year. Barbados is a distorted pear-shaped island lying 2585km (1610mi) southeast of Miami and 860km (535mi) northeast of Caracas, Venezuela. It's about the size of a large US city. The western coast has white-sand beaches and calm turquoise waters, while the cliff-lined Atlantic eastern coast is much more turbulent. Coral reefs surround most of the island. Over eons the buildup of coral on sedimentary rocks has created the bulk of the island. Water permeates its soft coral cap, creating underground streams, springs and limestone caverns. The most notable of the caverns, Harrison's Cave, is one of the island's leading tourist attractions. 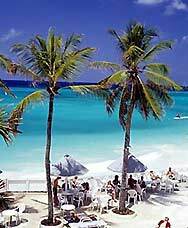 The best time to go to Barbados is during the cooler, drier months of late winter and early spring (February to May). Keep in mind that this is also the peak tourist season when prices are higher and places most crowded. The capital of Barbados is a busy commercial city set on Carlisle Bay, the island's only natural harbor. It's an architectural hodgepodge of modern and colonial, with side streets leading off into residential neighborhoods sprinkled with rum shops and chattel houses. True to the island's British heritage, there are monumental obelisks, gothic parliament buildings, and a large Anglican cathedral. Military history buffs should head to the Barbados Garrison, the 17th-century base of the British Windward and Leeward Islands Command. It has a museum, fortifications, brigs and cannons a-plenty. It's the oldest town in Barbados, but you'd hardly know it from its modern appearance. Founded in the 1620s, Holetown is now a major cog in the island's tourism machine. You can absorb some of the town's history at St James Church, a 19th-century structure that still has traces of its 17th-century past, including a bell inscribed with the name of King William. Along the southwestern coast there's a cluster of small, low-key towns with excellent beaches that provide much of the island's low to mid-range accommodations. St Lawrence, about 15km (9mi) southeast of Bridgetown, is the liveliest, offering plenty of opportunities to boogie down or fill up on flying fish. Dover Beach, the town strand, has powdery white sand. A few minutes' walk west along the beach at low tide brings you to the towns of Worthing and Hastings, which have interesting local crafts and lovely white-sand beaches.